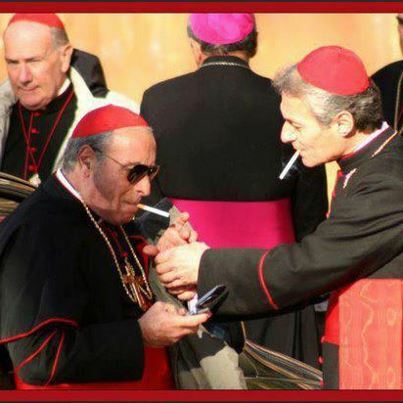 Well the election is over as signified by the white smoke as illustrated in the picture left. 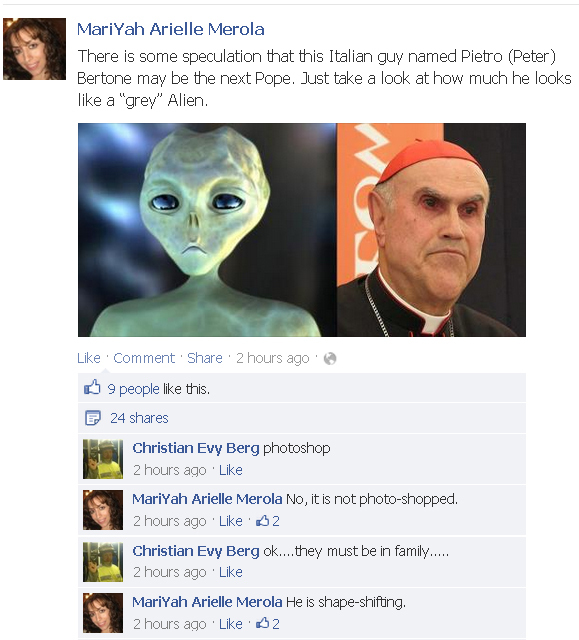 No shape shifting alien named Peter from Rome has been elected. The only spooky thing is that the election was concluded on 13/03/2013, now if that is not satanic what is!!! I wish to publicly proclaim that my blog got it all right about everybody else getting it wrong, enough said!! 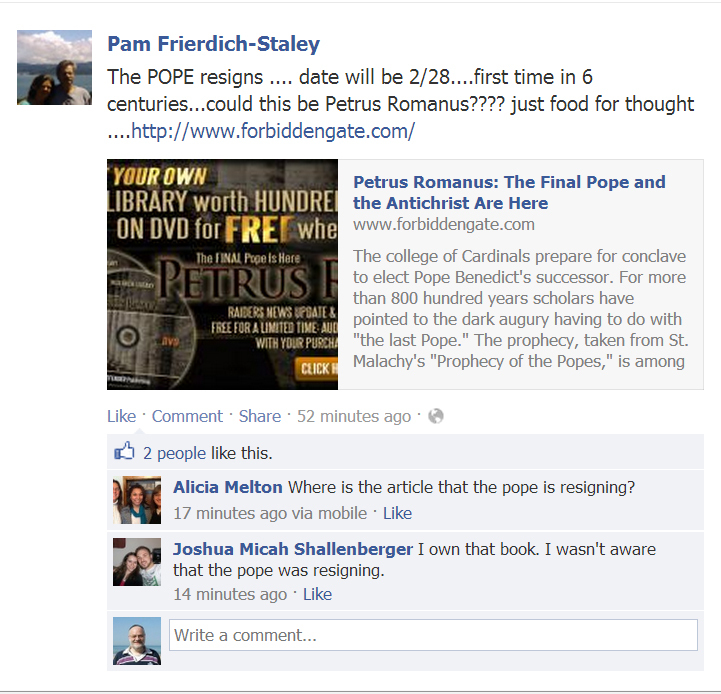 The conspiracy folks have already started re-writing their literature and now we are being bombarded about the Jesuits! It never ends! Well it’s a spooky old world out there and equally fascinating no matter what religious or non religious camp you find yourself in! Take for instance this weeks shocking news revelation that Pope Benedict is about to resign from the job. The last time someone resigned from the job was 600 years ago, some have even claimed it was 666 years ago. Spooky!! A source of amusement to me was the wide spectrum of reactions to the news. Various posts of the same news clip on different face book pages saw clashes between Roman Catholics and evangelical Protestants on what where supposed to be pages promoting tolerance and mutual respect!? A quick reminder by the page admin got them back to loving and respecting each other again, however! So that has got to be good has it not? Somehow I doubt it, when it comes to the crunch as even relatively recent history has shown; folks simply just go wild about their beliefs and things like tolerance and mutual respect just fly out the window! 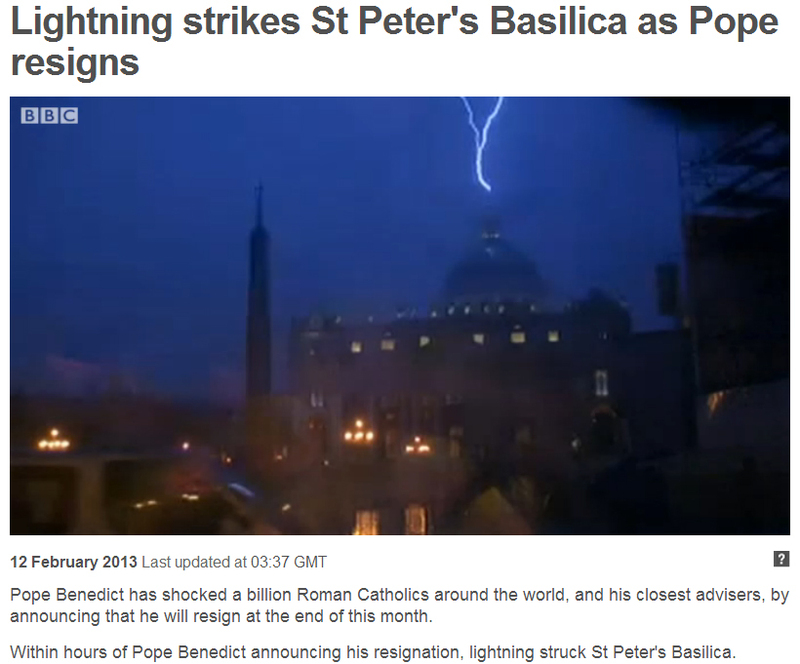 The lightening strike on the Vatican also has a similar flash back to the time of a mysterious fire in York Cathedral. York Cathedral was the subject of the very mysterious fire early in the morning on July 9, 1984, following reburial, the day before, of Jewish bones which, by some accounts, could have included victims of the twelfth-century massacre. The interesting aspect of this fire was that the part of the cathedral that was extensively damaged was the pre thirteenth- century section. 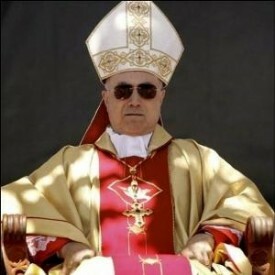 A peculiar twist to the Popes resignation is claimed to be as a result of an alleged upcoming action by a European government to issue an arrest warrant against Ratzinger and a public lien against Vatican property and assets by Easter 2013. The alleged upcoming action by the International Tribunal into Crimes of Church and State (ITCCS) (here also), to secure an arrest warrant against Joseph Ratzinger, aka Pope Benedict XVI, for crimes against humanity and ordering a criminal conspiracy. Is this for real? It would appear to be so (here). Of course with such a radical change in the papacy those in the ministry of making money out of religion were the first on the scene, offering various teaching materials at discounted prices! No doubt in this respect those selling religion are quite relieved that a new business opportunity has presented itself. All the skills of the sellers of religion were to be seen in numerous ministries all vying for business on the basis of good sales lines like: ‘see we told you (suckers) out there about this 2 years ago’ and ‘we cannot be sure that we can now supply all the need generated for knowledge obtained only from our exclusive learning materials, so buy now’. Before the mark of the beast stops you from buying it, no doubt! The prophecy of St. Malachy is also used by Protestants (?) to support the idea that the last Pope is to be called Petros Romanus or Peter the Roman as is widely translated of St. Malachy’s prophecy of the Popes. The popular press has also picked up on the prophecy and has widely identified Cardinal Peter Turkson as the prime candidate for the job of Pope. 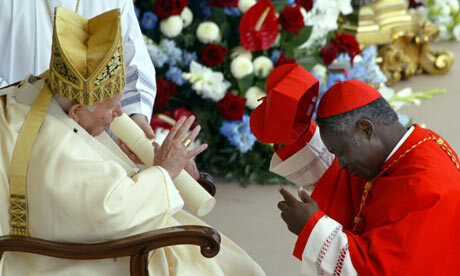 All the more surprising since Cardinal Peter Turkson is a black man from Ghana. However, not so surprising when the Illuminati conspiracy theorists point to the day of Michael Jackson’s funeral as being a diversion for when the Pope and President Obama got together and signed the Pope up as the world’s religious and political leader! And of course now that the Pope has a seat in the room of the last supper in Jerusalem, the stage is set for the fulfillment of prophecy when two black guys get together in Jerusalem and play the ‘book of revelation game’ together! Spooky! 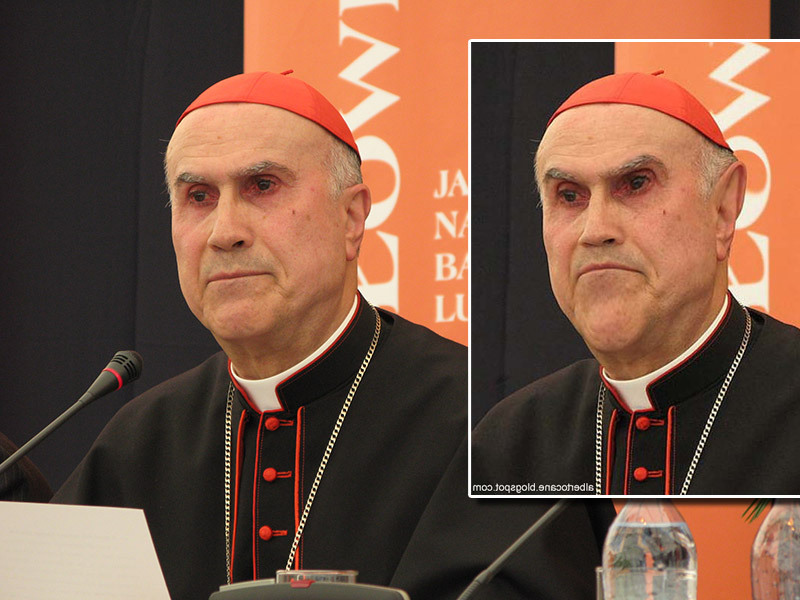 Another contender in the race is Cardinal Tarcisio Pietro (Peter in English) Evasio Bertone, born in Romano Canavese, Piedmont, the current secretary of state for the Vatican, who Pope Benedict XVI appointed Camerlengo, or Chamberlain, of the Holy Roman Church April 4, 2007. The coat of Arms of Cardinal Bertone include the keys of Peter. If you thought that the global Illuminati conspiracy theorists were bizarre then they are not a patch on some with the abuse of Christian scripture, particularly with respect to the book of Revelation and chapter 17 in particular. 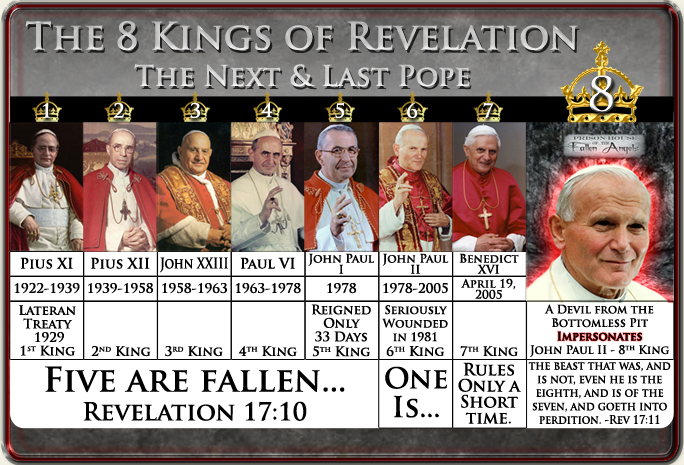 One group would have us believe that Pope John Paul II was a wounded 6th King followed by a 7th King who is Pope Benedict XVI. Finally the whammy comes with a resurrection, when the 8th King is the resurrected Pope John Paul II. The resurrection of course is not the real Pope John Paul II but Pope John Paul’s body re-animated by the devil himself. After all was he not buried in a trapezoidal coffin and the flags at the burial ceremony had upside down crosses? If that is not satanic what is? So what is my take on all of this? I consider the New Testament to be the biggest source of misery inflicted on humanity by the Church in general and on Jews in particular. To all which comprise the church both past and present including evangelical types, money making coreligionists, global Illuminati/ Opus Dei conspiracy theorists, Obama, the Pope and all the nations of the world, YOU WISH. You wish it is all about you when in reality you know who is going to ‘get it’ in the end anyway don’t you? To me the Big Question is how will/would Judaism handle “getting it” – with statesmanship or revenge? That is one I really would like to know the answer to – in my own lifetime? Jews and Christians both have been waiting LONG time for the answer to that one! In a word ‘Moshiac’, The Messiah will be instrumental for all to finally get it! I just wish that things could be hurried up a bit!! Thanks for this post update Menashe, I’ve dealt with MariYah Merola and her fanatical psychosis in the past, of course to no avail, but the reasons for my thanks is this…I had asked our Rabbi what I should do with some old xtian bibles that have been in boxes in our home since long before our conversion…he told us that in respect of the xtian religion to give them to a church or ask them what to do with them since they contained no Hebrew…his reason…that we can’t stop what they do. A mutual orthodox friend of ours said to perhaps bury them in the back yard for they were still considered the “word of G-d”…this confused me.